Sinn Féin TD Aengus Ó Snodaigh said some of the companies who expressed an interest in this scheme have “dubious records” in England where they provide similar services. 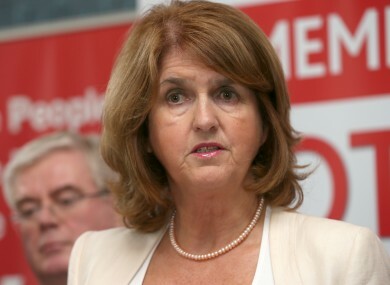 Minister for Social Protection Joan Burton. SINN FÉIN’S AENGUS Ó Snodaigh has expressed concern about a private company ‘cherrypicking’ jobseekers to find work for, as the government moves to outsource one of its job activation schemes. The tender process closes at the end of February for the provision of services for this scheme, JobPath, which is supposed to be aimed specifically at the long-term unemployed and those most distant from the labour market. Ó Snodaigh said that, as a company’s profits will be linked to the number of people it helps back into employment, resources may be moved to those closer to the labour market. “If we go from the experience of this in England in particular, companies there have been doing what is usually called ‘cherrypicking’ but, believe it or not, they call it ‘creaming and parking’ – they cream the best ones off the top and park those most difficult to get jobs for,” he explained. Some of the companies operating these services in England, which Ó Snodaigh described as having “dubious records”, have expressed interest in the tender process for JobPath. The Sinn Féin TD said many of those who have been unemployed for a long time have “quite a complex rage of issues” and staff working for the Department of Social Protection now have the training to handle this, with the creation of Intreo offices that offer all services for the unemployed under the one roof. “We should at least retain this in the public service, this money would be better spent on recruiting new people in to work as career guidance teachers who would have the specific skills to do this job,” he said. This isn’t something that should be down to just efficiencies, it might be easy to get someone a job but he might be back again very quickly if his issues aren’t addressed properly. It’s about getting them a job that’s sustainable for them. We could put all the PHDs into security jobs in the morning but that isn’t using their skills to their advantage and giving them opportunities where they can advance. This week in the Dáil, the TD will be calling on Minister for Social Protection Joan Burton to halt the tendering process and turn back from the privatisation of schemes aimed at getting people back to work. In response to a query from TheJournal.ie, the Department of Social Protection said it is not necessarily the case that contracts under JobPath will be with private companies. A spokesperson said many of the larger companies involved in this activity in other countries are not-for-profit organisations like the Salvation Army and Working Links. Email “Concern about 'cherrypicking' unemployed as government privatises job scheme”. Feedback on “Concern about 'cherrypicking' unemployed as government privatises job scheme”.